Paul Vogler is the founder of Atlanta Event Music, Atlanta Jazz Trio, Atlanta Steel Pan & Island Music and 2nd Line Atlanta. New Orleans native Stan Joseph started playing drums at 11 years old, and by age 13 was performing with Bourbon Street Second Line Bands. Recognized as a New Orleans Jazz All-star by New Orleans Magazine in 2003, Stan performed in 20+ U.S. states and jazz festivals in 9 foreign countries, performing with jazz legends Danny Barker, Chester Zardis, The Humphrey Brothers, Trombone Shorty, Kermit Ruffins and a host other legends in New Orleans. A regular performer at the New Orleans Jazz Festival, Stan has performed at legendary Preservation Hall several times. You may recognize him from his performance as a drummer in the movie "Ray" featuring Jamie Fox and the movie "Gigalo" featuring James Franco. Stan has recorded on several New Orleans Jazz CDs. No stranger to the Atlanta music scene and trombone player with some of the hottest Jazz Bands in Atlanta! 30 years as pit musician at Fox Theater, Alliance Theater and various other venues around the U.S. 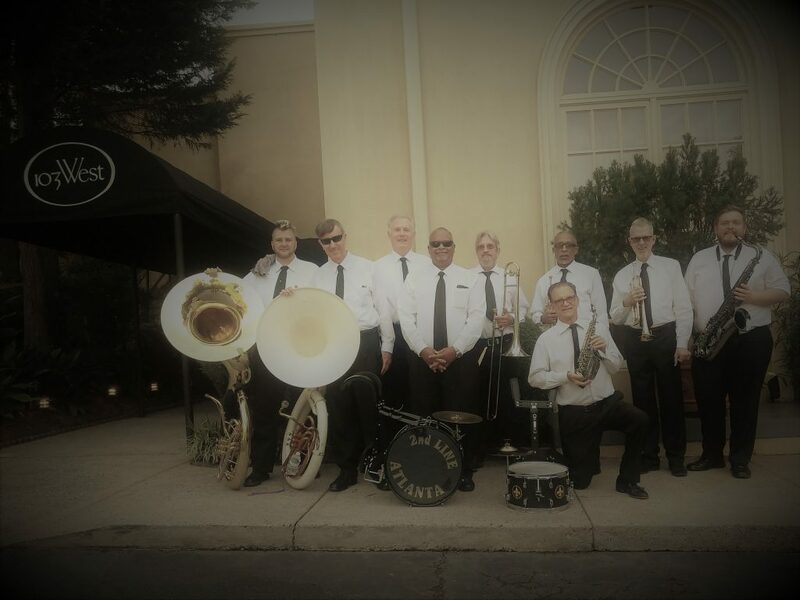 Besides performing with legends including Frank Sinatra and Burt Bacharach, Neil has traveled the world with Hotlanta Dixieland Jazz and performed with virtually all the Motown acts of the 60’s 70’s & 80’s including The Supremes, The Temptations, The Four Tops and Diana Ross. Accomplished bass player, performing since 1960, Ray's Linked in profile reads, "Just A Bass Player who pull 4, 5 and 6 strings." Need we say more? Ouida is an international artist with a background in gospel music. Ouida has toured Europe as a vocalist and performed on Royal Caribbean. She performed with the Southwest Atlanta Community Theater, and was a participant of The 2016 Atlanta Jazz Festival. Ouida is lead vocalist for Breath of Jazz, former lead singer of JAS Jazz Trio, “The Just Jazz” Band, and Frankie’s Blues Mission. Dan Reagan is possibly best known for his tours with singer Marc Anthony, husband of Jennifer Lopez, and Marc Anthony’s alternate group, the two time Grammy Award-winning Spanish Harlem Orchestra and his performance on their 2011 album. Dan has also played with Willie Colon, Eddie Palmieri, Tito Puente, and Conjunto Libre, to name just a few. Reagan was also a part-time instructor at the San Diego School of Creative and Performance Arts, as well as playing with the Gunnar Biggs Latin Jazz Quartet. As arranger and conductor of the Seed and Feed Marching Abominable; bassist with Col. Bruce Hampton,“Thumbs” Carllile, and Elise Witt. L.A. toured internationally also as tubist with Hotlanta Dixieland Jazz & The Atlanta Pops Orchestra. Well known Atlanta guitarist, Paul delivers a warm, engaging & energetic stage presence. His versatile 300+ song repertoire appeals to a wide variety of audiences. Paul's venues include The Venetian Resort in Las Vegas. Follow Paul at PaulNewkirkMusic.com. 2nd Line Atlanta Band. September 2018.